The Course aims at young biochemists/biophysicists and researchers active in related structural methods (protein crystallography, NMR, electron microscopy) with little or no experience in solution scattering. 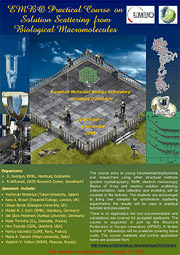 The course will cover basics of SAXS/SANS, instrumentation, data collection and modelling techniques. The students will be encouraged to bring their own samples to perform synchrotron scattering experiments on-site and the results will be used for practical tutorials and discussed on the last day of the course. Dmitri Svergun, EMBL Hamburg and Regine Willumeit, GKSS Research Center, Geesthacht. Advances in structure analysis using small-angle scattering in solution Cur. Opin. Struct. Biol. 12, 654-660 © Elsevier Ltd.
Small-angle scattering studies of biological macromolecules in solution Rep. Prog. Phys. 66 1735-1782 © IOP Publishing Ltd. Single copies of the available articles can be downloaded and printed only for the reader's personal research and study.